The No. 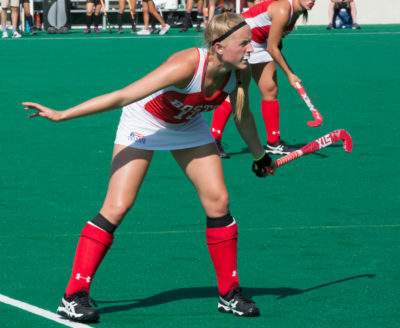 21 Boston University field hockey team fell to the No. 16 Harvard University Crimson 2-1 in the Terriers away finale. In a physical contest, the Terriers (10-7, 5-0 Patriot League) came back from a one goal deficit to the Crimson (11-4) but failed to mount a second comeback attempt. Harvard achieved their highest national rank in program history this season — getting up to No. 13 in the country on the Oct. 3 NFHCA Division I Coaches Poll, and may climb again with their victory over the Terriers. Harvard opened the scoring in the sixth minute when sophomore Casey Allen cleaned up a Mimi Tarrant rebound. Just over two minutes later, Terrier freshman forward Petra Hall netted her fifth goal of the season to tie the game at one goal apiece. Junior forward Kara Enoch assisted on Hall’s goal to extend her point streak to five consecutive games. Starr referenced the team’s resiliency and ability to fight back after getting in early deficits. Freshman Millie Baker started in goal for the Terriers allowing one goal and saving two shots. Junior Kathleen Keegan relieved Baker and maintained an identical stat line. Harvard scored the go-ahead goal with 25:05 remaining when Hannah Wellington made a stickhandling move into the circle and passed Keegan on a back-handed flail. Following a timeout with 6:19 remaining, Starr decided to pull the goalie in favor of an extra field player. Freshman back Kathryn Scheerer donned the green pinnie as the added athlete. BU was awarded just one penalty corner. Harvard had two and all three corner attempts came in the first half. Playing a ranked team helped the Terriers stay sharp for the remainder of the season. Starr added she was proud of her players for maintaining their composure. Part of that physicality is embodied by Terrier freshman Miya Denison. She took a ball off the face with some nasty bleeding, but returned to the game just a couple of minutes later with a large bandage on her chin. The Terriers return home to New Balance Field Saturday for their final regular season tuneup before the conference tournament against Patriot League foe Bucknell University.